Music is serious business: this was the earnest belief with which Azusa sought out the light music club in her new school. She did not, however, expect her outlook on life to be shaken to the very core. At first glance, Azusa is a no-nonsense girl with her own vision of what acceptable behavior is and what it is not. However, her sober attitude belies her true, sensitive character. When exposed to the sound of music, Azusa’s heart throbs for reasons she herself doesn’t understand. She instinctively hunts out people who, like her, see the hidden depth behind the art. 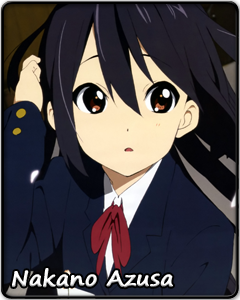 That said, Azusa also believes that the beauty of music carries along with it a responsibility. Naturally diligent, she expects the members of the group she joins to be like-minded people willing to devote every moment of their free time to arduous practice. When this turns out not to be the case, the young musician is torn between outrage and dejection. Not everything in the light music club will immediately fall into place, but Azusa does not remain blind to the affection her new friends show her. Deep within, she would like to join in on the fun… but only for a moment! The more she understands how the group’s relaxed behavior is also the source of the authenticity of their music, the closer she comes to a begrudging acceptance of their odd antics. Even if those antics include copious amounts of cosplay and forcing her to wear cat-ear accessories. As one gets to know her, Azusa slowly reveals more of her caring and vulnerable side. It would be better not to abuse that trust. After all, even the cuddliest cat has its claws.